Why has Weight Loss become such a Grand Delusion? Is Fast Weight Loss Healthy, Safe and Possible? More and more people are looking for that Miracle pill or workout/diet plan that will change their lives forever but the problem is, that they want it to happen overnight. These are great questions, and ones that seem to get lost when you’re in a rush to lose 10-20 pounds real fast before that big personal or professional event you have coming up. Most people want to lose weight fast, so they look for quick weight loss solution, preferably the kind that takes place while you sleep or go about your daily routine. They look for solutions that do not involve changing their eating habits or exercise level. They look to diet pills, special teas and even powders that are supposed to curb their eating! There are people who believe in “fantasy diets,” and there are certainly plenty of quick fixes on the market found in magazines, on the Internet, watching TV, in fliers, and even on the sides of buses. Weight loss industry advertising is about putting ideas in people’s heads that there’s a quick, easy solution; by taking this diet pill or supplement or using this machine or whatever they’re trying to get you to buy, you’ll look like the picture of a thin person or lose 20 pounds in 20 days! In reality, there isn’t any one thing that will make you lose weight fast, permanently or safely. Quick weight loss is a fantasy, an illusion that may cause your body harm, and mentally leave you feeling hopeless and defeated when you don’t lose the weight quickly. Achieving your ideal weight requires change and commitment. You must look deep inside at what’s been blocking you from losing the weight in the past. It requires changing your habits around eating and exercise. It requires you to love yourself. It requires you to believe that you deserve to live a healthy, happy, prosperous life. It requires you to expand your consciousness and your awareness and to be mindful of what you’re doing everyday while moving toward your ideal weight. You need to remember that weight loss is a process. You’re retraining yourself, deleting old habits and behaviors that got you where you are in the first place and creating new beliefs about who you are and the life you choose to live now. One more component that also comes into play is persistence. Even when you feel challenged, keep on going! * You don’t get an award for bravery for going it alone, so join a support group or create your own. * You don’t have to be perfect. Be excited about your small successes. * Stay away for an “all-or-nothing” attitude when you want to reduce a significant amount of weight. 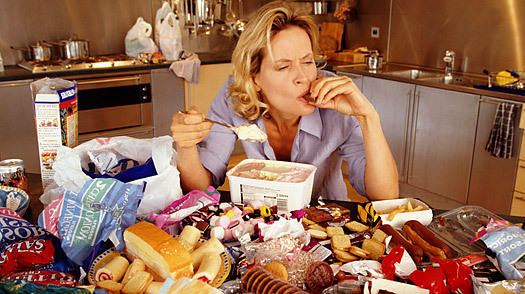 It’s okay that you ate junk food; it doesn’t mean you’ve totally blown it. * Shake the idea that you must follow an extremely restrictive diet to reduce your weight; lighten up. You’re changing your lifestyle, not simply trying to reduce your weight. True Fact: Most People Who Successfully Manage Their Weight Don’t Diet At All. They make healthy, permanent lifestyle changes such as cutting back on overall calories, practicing portion control, making better food choices, finding a hobby that gets them outdoors, and reigning in emotional eating. Successful weight loss focuses on weight management, not just shedding pounds. Research concludes that 1 to 2 pounds is a healthy, safe, smart, effective amount of weight to lose in one week. Approaching weight loss slower inevitably develops long-term healthy habits that you’ll use throughout your life, habits that will keep you healthy and keep the weight off permanently. Slow and steady is what’s required to reach your goal and maintain your weight; you needn’t waste your time or money and risk your health on quick fixes only to find out that they don’t really work. < Previous Are you doing Yoga cause you look good doing it????? Next > 5 MORE REASONS TO DO YOGA. I like the vlaauble info you provide in your articles. I’ll bookmark your blog and check again here frequently. I am quite sure I’ll learn many new stuff right here! Best of luck for the next!